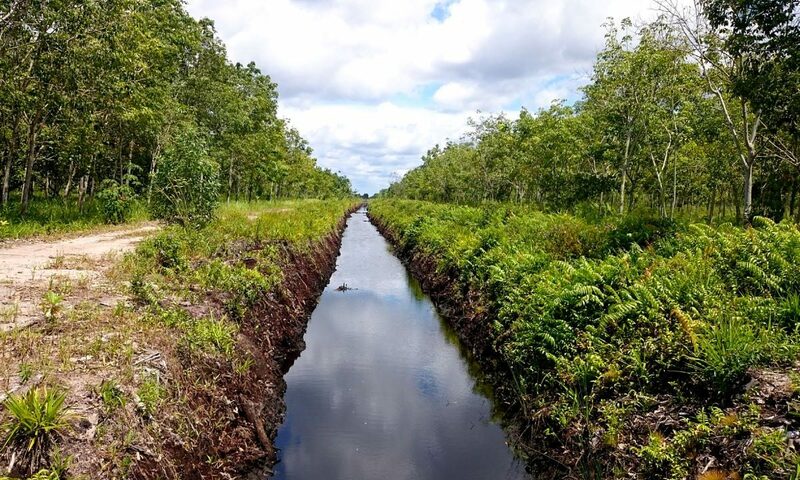 The Peatland Restoration Agency is looking at possibilities to develop agriculture on abandoned peat swamps from the failed Mega Rice Project in the mid-1990s. The agency has identified 1,250 square kilometers of peat areas with agricultural potential. The search is a part of the agency’s pilot project to test methods of developing agriculture without using fires. KIRAM, Indonesia — The Indonesian government plans to resurrect small tracts of the failed Mega Rice Project in Kalimantan, the Indonesian part of Borneo, by restoring abandoned peat areas and developing agriculture there. The plan was initiated by the nation’s Peatland Restoration Agency (BRG), which was established in the wake of the 2015 fire and haze crisis. That year, fires swept across Indonesia’s vast peat swamp zones, which have been widely drained and dried for agriculture. Smoke from the fires sickened half a million Indonesians and polluted the air above neighboring countries. The Mega Rice Project was initiated in 1996 by former strongman President Suharto. He aimed to turn Central Kalimantan province into the nation’s rice bowl, at a time when paddy fields on the country’s main central island of Java were widely being converted for other uses. To do that, the army general sought to carve out 1 million hectares of agricultural land — an area eight times the size of Los Angeles — from the peat swamps of Central Kalimantan. Thousands of excavators and tens of thousands of workers were deployed to clear peat forests and dig some 4,600 kilometers (2,900 miles) of drainage canals to keep the soil dry enough in the rainy season and the crops irrigated in the dry season. The megaproject was an unmitigated disaster, with not a single blade of productive rice ever grown. The nutrient-poor peat soil proved too unforgiving for Java-style rice cultivation. Jakarta ultimately abandoned it, leaving behind a dried-out wasteland that burns on a large scale almost every year. To return the fire-prone wasteland to its former condition, the Ministry of Public Works and Housing is blocking drainage canals in the area, focusing on the biggest canal in the network, in the district of Pulang Pisau. Meanwhile, the BRG has a project to establish agricultural areas where the land is prepared for planting without using fire. The first round of that project, done in cooperation with the Ministry of Agriculture, saw seven hectares (17 acres) in Pulang Pisau turned into rice paddies. Now the BRG wants to try 10 square kilometers (four square miles). Nazir sees the former Mega Rice area as a good fit. “Rather than keep abandoning them, it’s better to revive the productivity of these areas,” he said. To avoid repeating Suharto’s mistake, the ministry and BRG have mapped areas of shallow peat they see as potentially suitable for agriculture. The ministry came up with 1,450 square kilometers (600 square miles) in the former Mega Rice Project area, while the BRG identified 1,250 square kilometers (480 square miles). “We’re currently trying to set up the pilot project with the Ministry of Agriculture on a 1,000-hectare land in Pulang Pisau district, Central Kalimantan,” he said. Previously, the BRG helped a village in Pulang Pisau develop agriculture without using fire, starting from a one-hectare plot of peat soil. Now, there’s seven hectares of peat in the village developed without using fires. “We’ve done that on a small scale, now we want to try with 1,000 hectares of peat,” Nazir said. Banner image: A canal near Palangkaraya. Photo by Indra Nugraha for Mongabay.